The MJF Kids programme which guides underprivileged children towards a secure future has expanded the programme to Pallansena, Moratuwa and Siyambalanduwa. The Kids attended the camp held on the 25th and 26th of September at the Diyagala Boys Town (an orphanage for boys) in Ragama, with much enthusiasm and excitement. 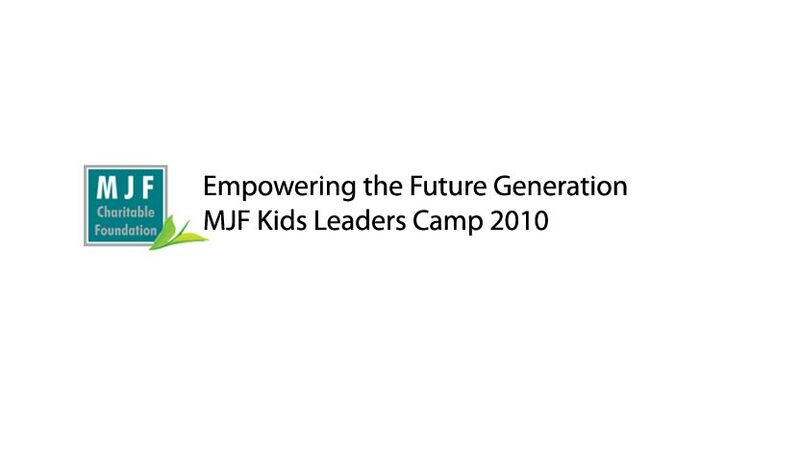 The objective of these leadership camps organised for the MJF Kids is to groom the children as leaders by training them to be responsible, teaching them about the importance of time, better utility of resources, and to understand and work within their teams, to overcome challenges in order to forge ahead for a better future. Leaders Camp 2010 is the second camp organised for the MJF Kids by the Foundation. The significance of this camp was that the children from Moratuwa, Pallansena and Siyambalanduwa attending the camp. Many activities, challenges and sessions which help the students to overcome challenges, develop positive traits in life such as trust, self- confidence, leadership qualities were conducted for the children. The children also got the opportunity to form new friendships, strengthen their skills and characters. On the 25th, the day started with meditation and physical training and the kids were divided in to groups. The children were encouraged to interact with each other and build team spirit. They engaged in numerous outbound activities which enhanced their ability to overcome challenges, to build confidence, to be aware of their strengths and weaknesses, and to work as a team and they were also trained on how to plan, implement and achieve their goals through utilising time and resources effectively. The children were grateful for the opportunities they received and absorbed everything taught at the camp. It was a unique experience for most of them and they shed all their fears as they engaged in their camp activities. The children were evaluated from day one and the necessity of punctuality and discipline were inculcated among them by the MJFCF team. Towards the end of the day the children were encouraged to perform and display their aesthetic talents to enhance their skills and confidence. The second day of the camp comprised of sports activities, music and dance. The children received training on first aid and they also had a session with a child psychologist. Most of the children who attended the camp are from poverty stricken backgrounds, orphaned and at times emotionally or physically abused. The psychologist encouraged them and guided them through his session on how to handle their home environment. The kids learnt about love and care for others and to shed all differences among them to work in unity. The camp ended with a camp fire attended by Dilhan C. Fernando and Dilmah staff. The children and the staff performed dances, drama, song and music and enjoyed the evening. The creativity and the imagination of the children were further displayed through their fancy dress costumes during the camp fire. Some of the children were nervous on their first day at camp. However with the end of the camp most of them were reluctant to leave. The Leaders camp 2010 was a success and the children were rejuvenated as they left the camp with hope for a better future.